I guess the subtitle on the kindle cover is a bit more accurate: "Practical wisdom for women who want to speak up, create, and lead." 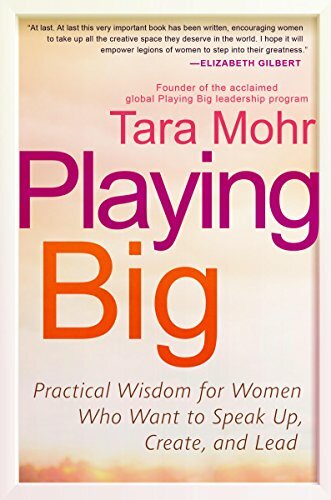 In the introduction, Tara clarifies that playing big "is not about climbing the ladder within broken systems. It’s about learning how to use your voice to change those systems." This book is for brilliant women like you. I wrote it so that you can move forward in pursuing whatever calls to you, so that your greatest gifts find expression. I wrote it because I’m tired of meeting women who have important messages to share but whose self-doubt is keeping them quiet. I’m tired of encountering woman after woman deluded by the myth that she needs to be more something— more qualified, more prepared, more expert— than she is in order to share her ideas. I wrote it out of allegiance to the art not yet made, the companies not yet founded, the books and op-ed columns not yet written, the critiques not yet voiced. I wrote it because all those expressions of goodness, of insight, of beauty, hang in the balance. I wrote this book because I want our world to be changed by you. It was the first self-help book in a long time which spoke straight to me. It was exactly what I needed to hear on so many different topics, and the concrete tips couldn't have been more useful. I had many "a-ha" moments while reading, because Tara had pointed out certain behaviors and tendencies that I'd been doing for years, without realizing they've been holding me back. While geared towards an audience of women, I highly recommend any interested males to read the book as well. The practical advice can be used by anyone, plus it would only be beneficial for men to get a peek into how many women think and act, so they might help the women in their lives play big. I highlighted a ton while reading (it was a kindle library check-out), and was planning to share some of those quotes here (and copy them down for myself elsewhere). To my disappointment, when I re-opened the book today, all of my highlights had disappeared. This hasn't happened before; library check-outs always save your highlights, but I think they're gone for good. Well, the highlights. But the phrases are all still in the book, simply mixed in with the full text. So the glass-half-full side of this is that I'll be hunting for a used paperback so that I can reread the book and highlight directly on the pages. It's a book that would be helpful to reread both now and again down the line, so a hard copy would be good to have.